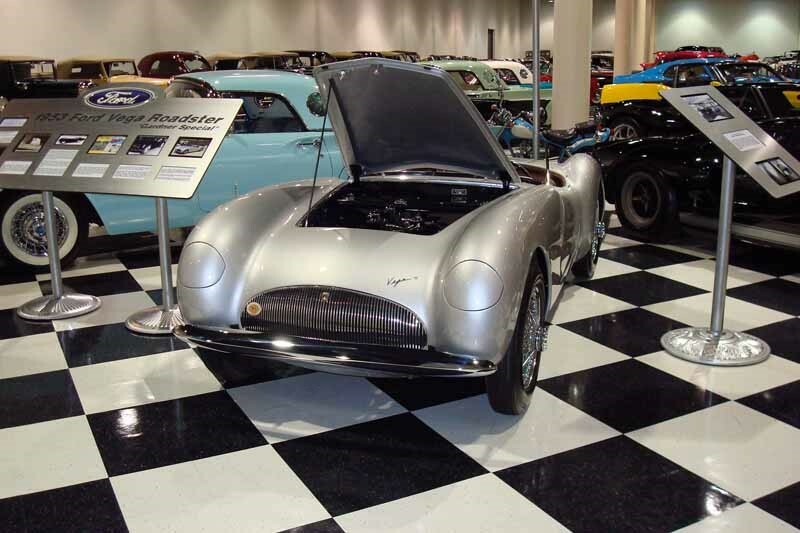 This “One Off” prototype was commissioned by Ford Motor Company and financed by Henry Ford II. 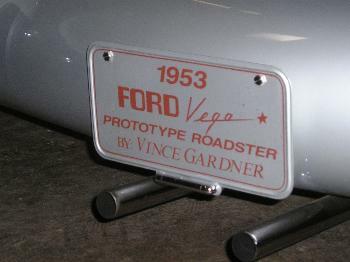 Willys Wagner, stylist for the international division of Ford and the legendary Indy racecar designer, Frank Kurtis awarded the project to automotive designer, Vince Garner. This is the complete history of this famous "one-off" concept vehicle ever built as told by Ford Motor Company archival information. 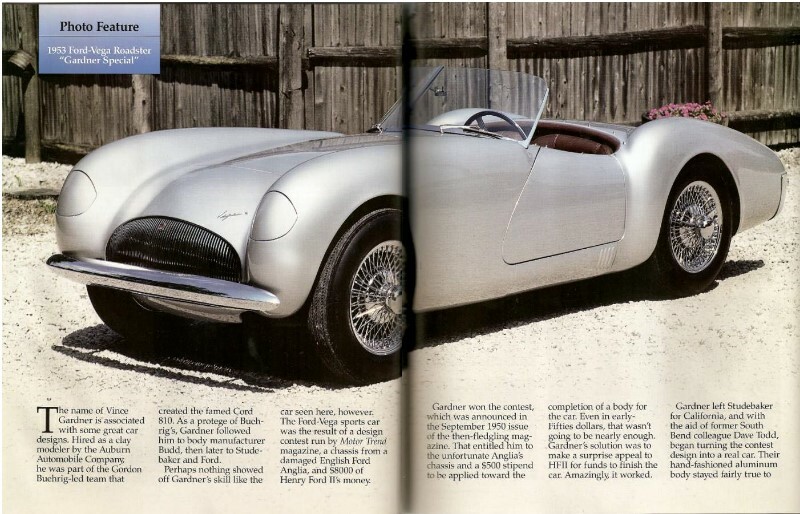 Ford Motor Company commissioned this "one-off" prototype via a Motor Trend Magazine design contest in September 1950. Winner of the design contest was legendary automotive designer, Vince Gardner. 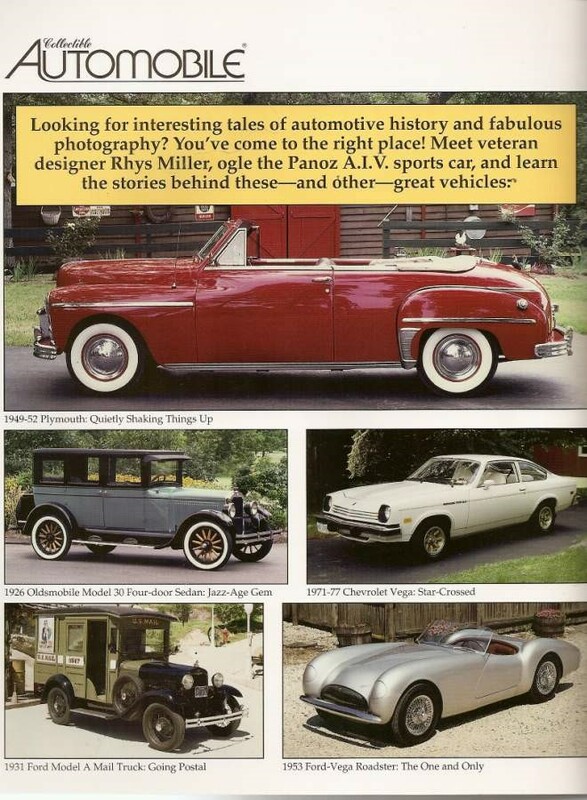 Vince's resume includes Studebaker, Ford, Budd car body manufacturer, and most notably, the Auburn Automobile Company design department. Under the direction of Gordon Buegrig, the design team was responsible for the famed Cord 810. 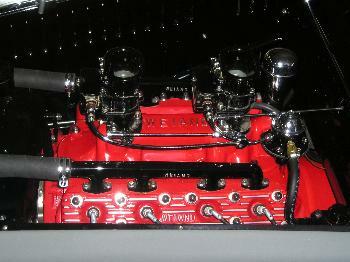 Vince's influences from his days at the Auburn Automobile Company are clearly evident in the Vega's (Cord-Like) disappearing headlights and swept "boat-tail like" rear. Vince was presented the award at the Los Angeles Motorama in November 1950 by Willys Wagner, stylist for the International Division of Ford Motor Company and by Chief Judge, the legendary Indy racecar designer, Frank Kurtis. The first round of financing from Ford for the famed Vega was a mere $500. Knowing this was not nearly enough, Vince decided to pay a visit to Henry Ford II. So one snowy night, he hopped on a Dc3 in South Bend, Indiana for a flight to Detroit. Vince didn't have an appointment but he did have his scale model mounted in this neat little box. Everything hinged so the top opened up and the sides all folded down to showcase the model. All the views of the car were drawn on the appropriate panel in blueprint form. Upon arrival, Vince marched into Ford's office where the receptionist asked what he wanted. Vince said, "I want to see Hank". When the receptionist pointed out that they did not have any Hanks in the office, Vince insisted "Oh yes you do. You have Hank Ford. Tell him Vince is out here with something he'll be really sorry to miss". After he succeeded in gaining admission to Mr. Ford's office, he plopped his clay model down on the desk and began talking non-stop. Ford put up with this for 30 minutes. Then, all of a sudden, Henry Ford II punched a button on his intercom and instructed his secretary to cut a check to Vince for $8,000. 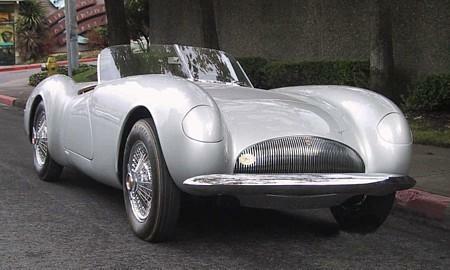 The Vega Roadster was to become a reality. 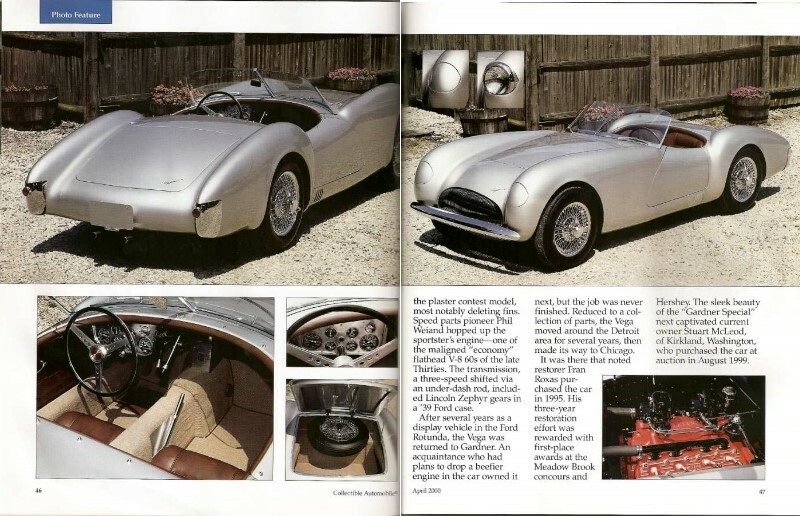 Vince relocated to Hollywood, California and spent over 2 years building the lightweight aluminum bodied roadster. 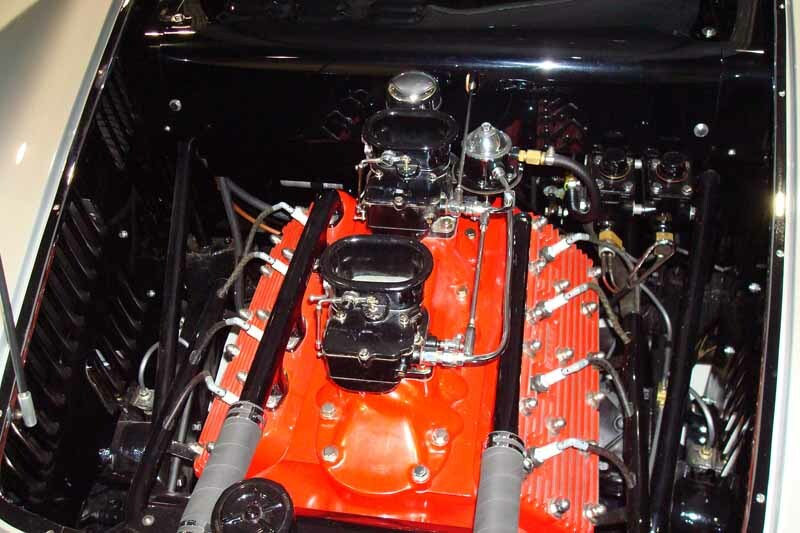 Gardner tapped Phil Weiand, a founding father of the Southern California hot rod movement, to help build power train components. When Henry Ford was in town, he would check-in on the progress and sometimes even bring his celebrity friends, Groucho Marx and Red Skelton. Howard Hughes also paid a visit. 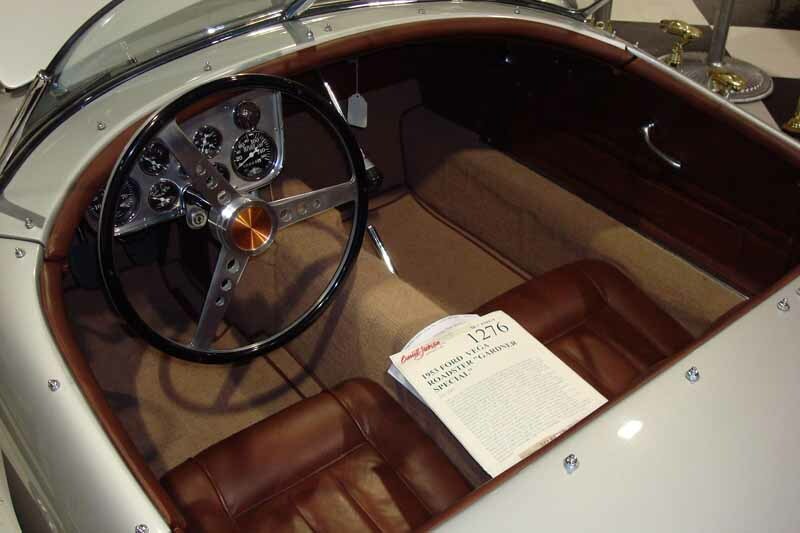 Upon completion of the car, Ford Motor Company summoned the "one-off" Vega Roadster back to Dearborn to celebrate the firm's 50th anniversary. 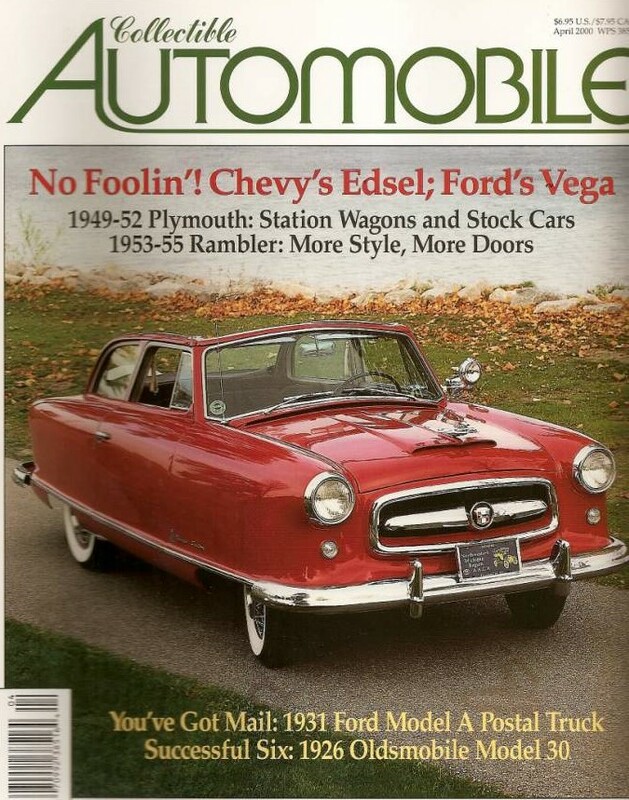 Ford displayed the Vega for a long time at it's Rotunda Exhibition Hall and then it was handed back to Gardner and eventually slipped into obscurity, however, not before a seed was planted. 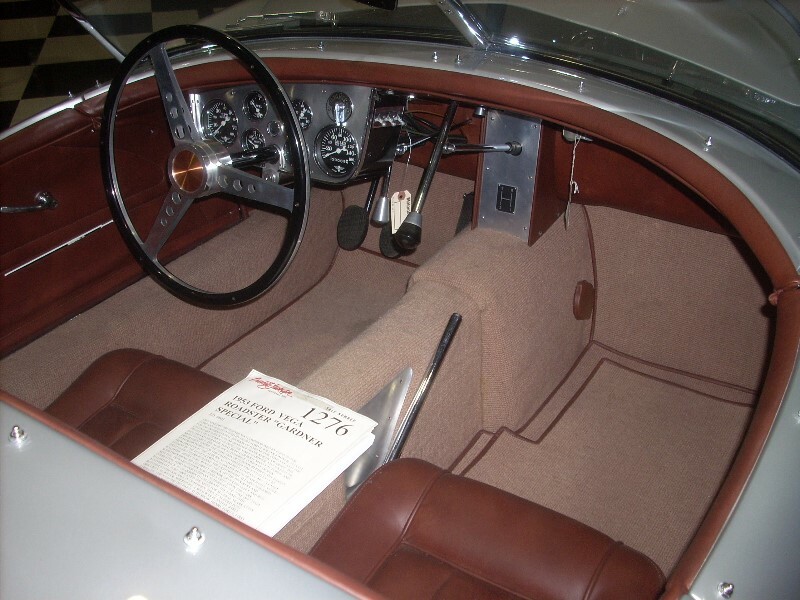 While strolling through the 1953 Paris Auto Show, Henry Ford II first acknowledged interest in building his own two-seat roadster, which would become the 1955 Ford Thunderbird. In the late 1990's noted restoration expert, Fran Roxas, restored the Vega. It was accepted for display at Pebble Beach and took first place awards at Meadow Brook Concours and famed Hershey. This beautiful and unique concept has now found a new home with the Pack Automotive Museum. Transmission: 3-Speed Manual (Lincoln Zephyr Gear in a ’39 Ford case) with a Dash-Mounted Shifter.